In today's guide you're going to learn everything you ever wanted to know about pool heaters. Why you need one, how they work, the different types, how to buy them, how to maintain them, and the best pool heaters you can buy. Let's start off with WHY you need a pool heater. Here are six reasons I can think of. You want to open your pool early in the year or keep it open longer for swimming season. You want to increase the value of your pool and your property. Your pool is not exposed to full sunlight, so it is rarely warmed naturally. Your family members refuse to swim in a cold pool, so you need pool heating. You like to swim early or late in the day when there is no sunlight warming your pool. You just want to cannonball into your pool whenever you want to without the risk of hypothermic shock. Swimming pool heaters can be categorized into three main types: pool heat pumps, solar, and gas. And each of them works a little bit differently, but they all use BTUs as their measurement sizes. That’s really about all you need to know in general, so let’s look at the specifics of each type of heater. A heat pump pool heater is still technically electric in that it uses electricity to run. The difference, though, is that it doesn’t use electricity to generate heat: it actually uses warm air to heat up the water that passes through the pump. The heat pump has a compressor which draws freon gas from an evaporator tube, which cools the tube, creating a hot gas from condensation. That hot gas is what passes through the condenser to heat the water by warming the outside of the tubes. The gas is pressurized and squeezed through the inside of the coil, mixing it with the cooler pool water being pumped through the pump and warming the water. This cycle is repeated over and over while it is running, keeping the pool circulating with the warm water it’s creating. This is the exact same technology used in air conditioners and refrigerators, except these appliances are used to remove heat instead of circulating it back through. Solar heaters consist of solar collectors, filters, pumps and control valves. The way they work is by pumping the pool water through the filter and then through the collector. That’s where the water gets heated and pumped back into the pool. There are two types of solar heaters—glazed and unglazed—and each one has its own use. Unglazed heaters are usually purchased for pools that will never dip below freezing, but glazed are usually preferred for harsher climates because they are a little more durable. An unglazed solar heater is usually made from a durable UV-treated rubber or plastic material. These are usually cheaper than glazed heaters. Glazed solar pool heaters are coated with a glass covering, making them more expensive. They are also made from more expensive materials such as copper tubing, and are also more efficient than unglazed heaters and can be used all year. A gas pool heater runs on gas or propane and it operates by passing water through a combustion chamber that burns the gas, warming the copper coils. The water is passing through these warm copper coils before returning to the pool. Gas heaters have some advantages but an important factor to consider before choosing this type of pool heater is the natural gas or propane cost in your area. Since this cost varies, they are more expensive to run in some areas than in others. Heat pumps are usually 50,000 BTUs per 10,000 gallons of water. For solar heaters, they're not quite as specific—you'll use square footage of your pool to determine how many solar panels you need. For example, if the pool is 300 square feet, you will use 150 square feet of solar panels. But there are also a few other things to consider in a pool heater size. For example, if you only plan to heat the pool on weekends, you might want a heater that heats it up more quickly, so you would likely want to choose a gas heater. On the other hand, if you expect to maintain a moderate water temperature in the pool, a small pool heater can be used. It just won’t be as energy-efficient. For solar heaters, you will also take into account how much daily sunshine you have, using fewer solar panels in areas with lots of direct sunlight. There are more things to consider than upfront costs when choosing a pool heater, because each comes with its own costs to maintain. A gas pool heater is usually the cheapest of the bunch to buy, but if natural gas or propane costs in your area are high, then it could end up costing more every month. A heat pump is the next on the list, usually costing a little more than a gas pump upfront. However, it does operate on electricity, so depending on the operating schedule, it could end up costing a lot each month as well. A solar heater is probably the most expensive of the pool heaters, but the energy it uses is free, so it’s monthly costs will be much less. Because all pool heaters work a little differently, your climate plays a part in the best one for you. If you live in a southern state with lots of direct sunlight, a solar heater or heat pump will work well for your pool. But if you live in a northern state with extreme temperatures, a gas pump is probably the best purchase for you. As with all other pool parts, your pool heater needs to be maintained throughout the year to make sure it lasts as long as it possibly can. Each type of heater comes with its own set of typical issues you will need to look out for. Low water flow. This is the primary issue most heat pump owners have when there is a problem with them. Check the valves to make sure they are fully open so that the pump is getting enough water flowing through it. Next, check the filter to see if it needs to be cleaned. No power. Check all your power sources, including the breaker and connections. Look for faulty wiring. No heat. Check the thermostat to make sure it is set higher than the temp of the pool water. Also, check the outside temperature. Heat pumps should only be operated with above 50°F temps. Low freon. Your heat pump likely has a setting that will give you error codes and this is a common one. You will usually get it if it’s below 50°F. Ice-covered unit. This is another issue that might happen in temperatures below 50°F. Most units will shut off on their own when ice begins to accumulate and should start back up again when outside temps reach safe levels. Pilot won't light. This is probably the number one issue most people have with their gas heaters. Make sure the vents are clear and the gas pressure is normal. Heat pump won't ignite. Make sure the heater switch is on and that the thermostat is set to a higher temp than the pool water. Water not warm enough. Usually you just need to adjust the thermostat if this is the case, but it could also be that your heater is not the right size for your pool. If both of these seem to be okay, you may need to call a professional to check for faulty mechanics. Leaky heater. First check the connections and gaskets to see if they are damaged; these can be replaced much cheaper than other parts. If those are okay, it could be the heat exchanger which can be damaged by pool chemicals and extremely low temperatures. If it leaks while the burner is lit, it could be condensation buildup or too much air flow. Rust in your pool water. Your pool chemicals can start to corrode your heater elements. If you notice this, check to make sure your pool chemicals are in balance. Dirty filter. If your solar heater doesn’t seem to be heating like it should or as well as it used to, most of the time, it’s because the filter needs to be cleaned. Check your filters regularly and replace when needed. Not enough sunlight. Another issue solar pool heater owners face is trying to use the heater when there is not enough daylight or during cloudy conditions. A solar heater needs 4-6 hours of direct sunlight a day to operate properly. 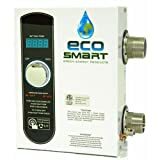 All Ecosmart pool heaters are compact and made to be easy to install, and this electric tankless heater (click here to check the price on Amazon) comes equipped with a set and forget temperature control with a remote control for easy access. It’s modern-looking and packed with power and can be used for any type of pool, and uses the latest flow sensor technology so that it is more reliable and lasts longer than units with pressure switch activation because it reduces the occurrence of burnt elements. Hayward HeatPro Titanium use a titanium counter-flow exchange to withstand even harsh conditions and heavy use. They are heavy-duty and efficient, operating very quietly, and are created with an ultra-gold corrosion resistant evaporator fin and injection-molded UV resistant panels to increase durability. These pumps are lightweight, small and easy to install and maintain. It has a built in thermostat for automatic pool control and heats very quickly. This pool heater from Fibroheat (click here to check the price on Amazon) has an output of 55,000 BTUs for large-capacity output. It uses Copeland high-pressure compressor and titanium parts so that is is durable and dependable, and has received the US Department of Energy seal for top energy efficient system, running at an average of about 25 cents per hour. It’s also very compact and modernly-designed, and easy and quick to install and made of all metal parts. It’s made to withstand the elements and function well with your other pool elements and comes with a 10 year warranty. This gas heater from Pentair wins best in class for energy efficiency and it heats up quickly, and is also deemed eco-friendly for its low NOx emission rating. Its design is compact and sleek so you can maintain the modern look of your pool. What really makes this design stand out is that it doesn’t have a pilot light to mess with. Instead, it’s all digitally controlled with push buttons, making it super easy to operate. It is tough and durable, made to stand up to the toughest elements with its rustproof design, and is easy to install and maintain. It’s water pressure switch automatically shuts off to prevent overheating with a built-in flue sensor. This efficient unit from Hayward (click here to check the price on Amazon) packs a lot of power for pools up to 450 square feet and is efficient in even low outside temperatures. It ignites electronically for dependable automatic operation, and is super easy to install with a 120 volt electric plug in. It uses an induced draft technology for maximum heating performance, while the outer cabinet stays cool to the touch so there is no risk for injury. It’s simply designed and easy to operate, heating a pool in a matter of hours. Another Hayward product, the H400FDN (click here to check the price on Amazon) one also meets the emissions standards in all regions. It's designed to install easily by a professional and is easy to use with saltwater pools, and can be connected to either a 110 or 220 volt power source, making it versatile for any pool owner. It's lightweight, modern and low-profile so that it blends in with any surroundings, and uses the latest technology in digital LED display and digital control panel. It's built to last with stainless steel burners, Cupro Nickel heat exchangers and insulated combustion chambers for maximum durability and longevity. And its patented polymer header combines with the bypass valve to increase efficiency. This Hayward pool heater (click here to check the price on Amazon) received the Garfield’s Top Clover award for its quality, ease of installation and durability. It's known, like its other units, for its Cupro Nickel heat exchanger, which makes it stand out above the competition. It heats a pool very quickly and is built to last. It uses a hydraulic design that reduces circulation, helping ease the working time of the pump, making it energy-efficient and easy on the pump. It also has low NOx emissions and works reliably year round. This Hayward heater (click here to check the price on Amazon) uses induced draft technology which helps it to function in even the harshest wind and weather conditions. It comes equipped with an automatic ignition control for easy lighting and a 120 volt plug in for easy installation, and is extremely energy efficient and can be used on pools up to 450 square feet. Smartpool solar heaters (click here to check the price on Amazon) heat your pool water using your existing pool pump and sunlight, making them extremely cost and energy efficient. This unit is designed with polypropylene heat collectors and 80 square feet of solar panels; the panels measure 4 feet wide by 20 feet long and can be mounted on the roof, ground or a fence. They come in both above ground and inground models, and are very easy to install but you will need to purchase an installation kit separately. These pool heaters from GAME (click here to check the price on Amazon) are dome-shaped, providing a super sleek and modern look. They're designed to create a space that collects the most amount of UV rays in the smallest space, making them efficient and technologically advanced, and are most effective in pools up to 10,000 gallons. It's considered to be the most efficient solar dome heater on the market, creating a kind of greenhouse effect for heat transfer. Choosing the best pool heater for your needs depends on many factors: where you live, your budget, and the size of your pool. Whatever type of pump you decide to use, it’s always great to consult an expert who specializes in pools in your area before you make a purchase. With all the different options available, there is sure to be one that fits your needs and your budget!